Have you considered the most important of your options when marketing your Magento-based online store? While the cost of marketing and selling is one of the largest outlays, smart e-commerce businesses can effectively measure and scale the use of the ROI-positive tools. This blog post is the fifth installment in a series about creating e-commerce stores, starting from reviewing the factors affecting Magento Development Costs, then discussing your options in selecting a Magento Software Development Provider, moving to the value of Magento Support and discovering how to set up your store for proper Content and Functional SEO. Which Magento Marketing Tools Should You Use? Every business is unique and the arsenal of Marketing tools for Magento is extensive, but that shouldn’t stop you from evaluating what works in your particular business. The marketing landscape is constantly shifting, with some marketing techniques becoming ineffective while others gain more prominence, but the focus for all of them is converging towards measurability, profitability and ROI. Let’s say you have a product that costs $10 to produce and sells for $15. You expect to sell one product to each of 100 new customers as a result of running a marketing campaign. Your total sales are $1,500, and if your marketing campaign costs are $200, your ROI is ($1,500-($1000+$200))/($1000+$200), or 25%. A simple calculation like this may need to be adjusted for the customer lifetime value (if your customers typically make repeat purchases), but it should be a good guideline for supplement your marketing budget with expected ROI as a guideline. Note that accurately measuring the true ROI sometimes requires calculating an average customers’ lifetime value, and establishing that value as a benchmark is the key to measuring the effectiveness of all marketing initiatives and using them profitably. In the Magento ecosystem, Marketing tools are available as add-ons and extensions. Let’s review those you can implement quickly, test inexpensively and reliably measure their impact. To do so, you will need both a traffic analysis tool like Google Analytics and a CRM system to keep track of your customers’ actions and repeat purchases – especially if your customers make repeat purchases. A good candidate for this is a customer and product intelligence extension called Jirafe, which becomes truly useful for stores with many products and those receiving at least 50-100 orders per day. One you track the conversion funnel, you can test paid advertising like Google’s AdWords. Keep in mind that Google charges for clicks – not actual sales conversions – so you will need to set up conversion tracking to determine the ROI for paid advertising. The cost of a sale will be the cost per click divided by the conversion rate (in percentage format). Since Google uses an auction bidding system for the ads it serves, the cost of advertising depends on your competitors’ advertising budgets. You should definitely engage an AdWords Certified specialist or an agency if the product you are selling is unique and has market potential, but has little or no competition. When customers are already familiar with your brand they actually expect to hear from you, especially if the information you provide is valuable, personalized and sent not too often. You should use an email campaign software such as MailChimp, dotMailer or similar for designing the email templates and sending out the actual emails, as these companies have optimized the process to bypass spam filters for legitimate mail and are CAN-SPAM Act compliant. If you are ambitious and want extensive analytics and optimization for ezquisitely fine-tuned and event-triggered email campaigns, take a look at Bronto marketing automation – another SaaS tool developed as a Magento extension. Affiliate marketing is essentially a term for paid referrals, or recommendations that generate sales. Aside from direct product sales on Facebook, Twitter and Pinterest, a great way to expand your marketing on social networks is to leverage your existing users’ social connections to promote your products in exchange for customer loyalty rewards. This is where Customer Loyalty Reward programs like SweetTooth can be an asset. The advantage of an expertly set up rewards program can help you both acquire new customers and motivate your existing customers to make repeat purchases more often. You can get truly creative by offering customers exclusive products or experiences redeemable exclusively in exchange for reward points only! It’s no secret that the airline industry has long been using the reward points (or “miles”) to keep their customers loyal, but the modern e-commerce businesses can take this concept much further. Trust is one of the biggest assets in any business, and it is especially in demand online. While properly setting up your store for SEO is important, that alone is not enough. SEO and Social Proof are becoming interlinked as the search engines are increasingly analyzing the data from across the various Social Media channels to rank your store and products in organic search as the web crawlers seek relevant, recent new data. Every industry is unique, so being an authority on your product use and care is a great opportunity to start a blog on your topic, share insights and start conversations on social media. A word of warning on blogging: WordPress is a popular choice for blogging, but be aware that blogging platforms have to be configured properly, as all blogging platforms are more vulnerable to malicious software than the Magento platform itself. Yet when properly configured, blog posts shared on relevant social networks and forums are a great tool for increasing your website’s SEO authority and a source of potential customers. In addition, if you choose to have a customer rewards program (as recommended above), you can offer points and discounts for product reviews, verified by your customers’ social network login credentials. A word of warning: simply adding a social widget is not enough, as having the social info with no reviews and 0 followers is woese than not having one! Reviews are important, but customers are increasingly seeking unbiased opinions from people they know and are increasingly skeptical of reviews given by strangers. 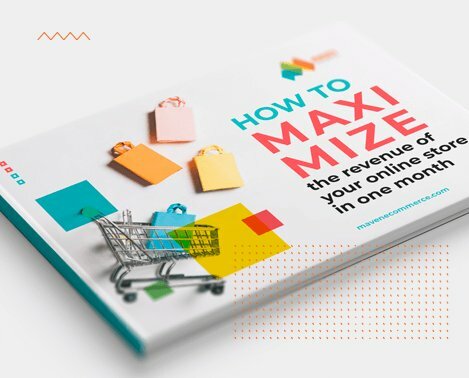 There is no shortage of Marketing tools for e-commerce stores built on the Magento platform, but all should be tested relative to their ROI potential. Conversion funnel analytics enables you to measure the profitability of every marketing activity, so make sure to take care of that first. Once analytics are set up, test all the tools at your disposal – paid advertising, email marketing, affiliate marketing and SEO improvements. And, as always, free to contact Maven if you are having difficulties and need assistance with making sense of your Marketing options on the Magento platform.